The Merchant of Venice is an Elizabethan romantic comedy that time and changing mores, especially attitudes towards Jews and a post-Holocaust abhorrence of anti-Semitism, have transformed into a modern dark tragicom­edy. Shylock, the comic blocking figure who, like Hermia’s father in A Midsummer Night’s Dream, stands in the way of young lovers, has become in most productions of The Merchant of Venice the play’s tragic protagonist. In the Elizabethan romantic comedy, Shylock’s daughter, Jessica, and her Christian lover, Lorenzo, must circumvent the old usurer in order to marry; and before Portia and Bassanio and Nerissa and Gratiano may consummate their marriages, Portia in a thrilling cross-dressed performance as a brilliant young lawyer must save Bassanio’s friend, Antonio, from Shylock’s murderous attempt on his life. She succeeds in a last-minute courtroom tour de force that uses Shylock’s legalism against him: if in taking his contractual pound of flesh from Antonio’s breast, Shylock spills a drop of blood or takes even slightly more or less than a pound, his own life is forfeit. Defeated and then “generously” ordered by Antonio and the Duke of Venice to convert to Christianity, thereby saving his life and his soul, Shylock leaves the stage to the lovers for the play’s idyllic and humorous final act. This modern darkly tragicomic Merchant of Venice gives us instead a sympathetic Shylock abused by Christians, especially Antonio, abandoned and robbed by his only child, and fighting back in the only way he can in an environment of intense and pervasive anti-Semitism: that is, by insisting on a strict interpretation of the law of contracts that Venice must uphold or risk losing its position as the most important commercial power in the Mediterranean. In this version, Portia’s cunning interpretation of the relevant legal statute deflates Shylock’s businessman’s belief in the law of commerce, while the order for his forced conversion destroys his sense of identity as a Jew and as a human being. Shakespeare’s Globe’s production of The Merchant of Venice, directed by Jonathan Munby and one of several international shows visiting Chicago Shakespeare Theater during this quatercentenary year, does the best job of balancing the Elizabethan romantic comedy and the modern tragicomedy of any production I have seen. After almost half a century I still vividly remember Laurence Olivier’s acutely intelligent and heartbreaking Shylock in a production directed by Jonathan Miller that was marked by the anti-Semitism of all of its Christian characters. But by focusing on the tragedy of Shylock and allowing the Christians no redeeming features, this production, brilliant and groundbreaking as it was, lost some of what is or can still be delightful in the play’s romantic comedy. Jonathan Munby’s Merchant, by contrast, gave to every character his or her due. There was no attempt to gain extra sympathy for Shylock by sentimentalizing his relationship with his daughter—at their first appearance together they were quarreling in Yiddish. And the Christian characters were a more morally mixed and nuanced bunch than in some productions I have seen. While excoriating anti-Semitism, Munby also presented the more complex and perhaps uncomfortable truth that idealism and intolerance, decency and bigotry, can exist in the same person and that being an outsider oneself (Antonio as homosexual) need not grant one compassion for another kind of outsider. 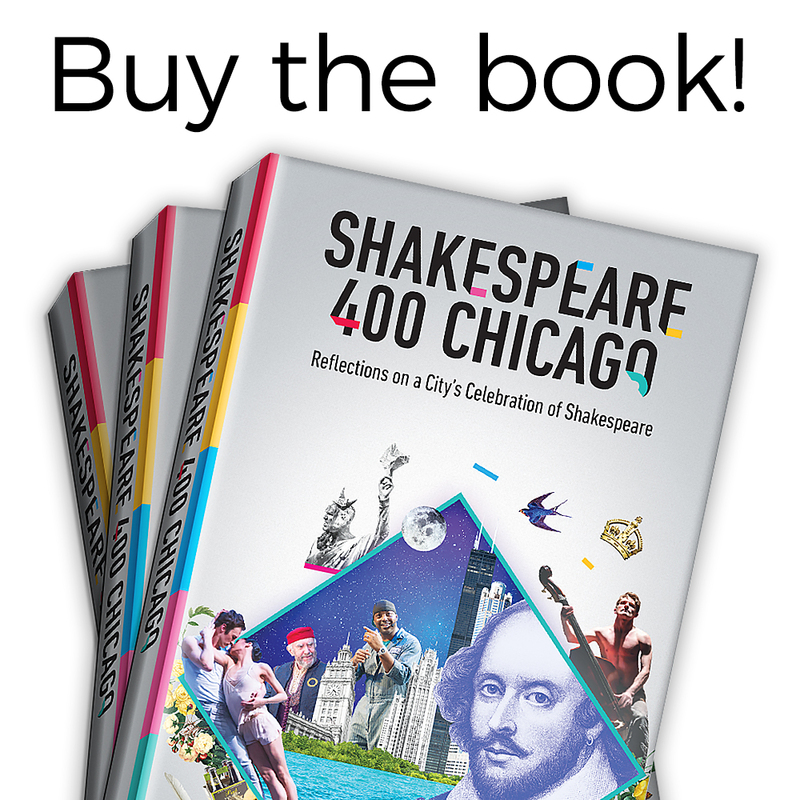 Chicago Shakespeare Theater’s stage was dressed to evoke rather than precisely imitate Shakespeare’s Globe in London, where Munby’s production originated. Dark curtains covered the back wall; simple tables, chairs, and plinths were brought on as needed; actors entered through a large central opening, from the sides, and through the audience. The permanent architectural features, as in Shakespeare’s Globe, were two tall pillars, whose capitals were lit up to resemble gold in the Belmont scenes. The period costumes also emphasized the contrast between Venice and Belmont. The Venetians wore dull colors highlighted by red; in Belmont blonde heiress Portia wore gold, and Bassanio and Jessica, too, exchanged their drab Venetian clothes for golden ones in Belmont. Sixteenth-century Italy was evoked, too, by bursts of Italian music and pleasing Italian songs that punctuated the production and provided a basis for Lorenzo’s beautiful invocation of the power of music in act five. The production opened with a noisy carnival scene that was already underway as the audience took their seats. This prologue set the tone for the action to come as the good-natured jollity of maskers, musicians, and courtesans gave way to a violent, unprovoked attack on two Jews as they crossed the stage. In keeping with the spirit of performance at Shakespeare’s Globe, the actors in the prologue and in the play proper interacted with the audience. In particular, Launcelot (an engaging Stefan Adegbola) brought up onto the stage members of the audience to play the “fiend” and his “conscience” as he debated leaving Shylock’s service. At the performance I attended (August 14), the first “fiend” (a local Shakespear­ean perhaps?) to the great amusement of the audience left the stage at the line “use your legs,” and a second had to be recruited. At other times actors drew the audience into their world by referring to particular spectators. Most interestingly, Shylock (Jonathan Pryce) spoke his early asides to the audience, at those moments incorporating all of us as fellow Jews in an anti-Semitic society. The Christians in Munby’s production were not uniformly anti-Semitic. I have seen worse: for example, the vicious Venetians of Chicago Shakespeare Theater’s 2005 production, which featured Mike Nussbaum as Shylock. Most virulent of Munby’s Christians were Antonio (Dominic Mafham) and Gratiano (Jolyon Coy). Antonio was initially a sympathetic and dignified figure in his impossible but generous love for Bassanio. When Solanio (Raj Bajaj) asked him if he was sad because he was in love, Mafham’s vehement “Fie” spoke volumes about the pain of keeping his feelings private. But in his interactions with Shylock, this Antonio was exceptionally brutal, verbally and physically, and when finally he shook Shylock’s hand to seal their bargain, he immediately wiped his own on his garment. Gratiano, immoderate in all things (he first entered the stage in the process of throwing up and later was accused of fathering a baby), equally displayed mean-spiritedness, not only baiting Shylock during the trial but also attempting—through gestural interjections—to dissuade Lorenzo from marrying Jessica. To his credit, Lorenzo (Andy Apollo), while clearly one of the boys, stood up for his love for Jessica with some spirit. Allowing Lorenzo this grace paid off in the last act when Shakespeare gives this young lover the most beautiful lines in the play about the loveliness of the starry night and the harmony of the music of the spheres: “Such harmony is in immortal souls.” In the Olivier production, the moment had to be subverted in keeping with the general degradation of the Christians—the foppish Lorenzo carefully put his handkerchief on the ground for himself to sit on. Apollo’s Lorenzo put his jacket on the ground for Jessica. All the difference in the world. And an exquisite moment was preserved. The most decent of the Christians was Dan Fredenburgh’s Bassanio, the most likeable Bassanio I can remember. Unlike Antonio, whose excess he attempted to restrain, Bassanio did not wipe his hand after shaking Shylock’s (admittedly a low bar). Despite his impecuniousness, he did not play Antonio, instead gently deflecting an attempted kiss on the lips, and he appeared truly to love Portia, not only her money. Though more acerbic than her Bassanio, Rachel Pickup offered a somewhat nuanced portrait of Portia. The audience could sympathize enough with her wit and charm and her beautifully spoken love for Bassanio to enjoy the romance of the caskets plot while cringing at her racial prejudice towards the Prince of Morocco and later Jessica. The choice to make Morocco (a character whose eloquence has encouraged critics to see him as a trial-run for Othello) as ridiculous as the Prince of Aragon somewhat mitigated the bad taste left by Portia’s racist abhorrence of this suitor. Both Giles Terera as Morocco and Christopher Logan as Aragon gave highly entertaining over-the-top performances of cultural stereotypes that brought the house down, leaving one to wonder perhaps whether it is, after all, any more acceptable to mock Spaniards (or Dutchmen or Englishmen, like Portia’s other undesirable but unseen suitors) than Africans. Portia was least sympathetic in her offhand attitude to Jessica. Both she and Nerissa (Dorothea Myer-Bennett) repeatedly had difficulty remember­ing Jessica’s name (in the manner established by Joan Plowright’s Portia in Olivier’s production). And at one point Portia handed Jessica her wine glass as if she were a servant. In the court scene Portia really did not figure out how to save Antonio until the last possible moment, making this well-known episode something of a nail-biter. But though perhaps less calculating than some Portias in this respect, Pickup was nasty enough in her put-down of Shylock. The show belonged to Shylock—and to a greater extent than is usual to Jessica. Advance publicity prepared audiences for this focus by foregrounding the real-life father-daughter relationship between Jonathan Pryce’s Shylock and Phoebe Pryce’s Jessica. Maintaining his precarious masculine dignity through a harsh self-sufficiency, Pryce’s Shylock was as passionately prejudiced against Christians as they were against Jews, obviously with more cause. But though he intended retribution from the beginning in proposing the “merry sport” of his contract with Antonio, the savagery of his revenge was primed by his daughter’s elopement with a Christian. Expecting to triumph in the court of law, Shylock was instead humiliated by Portia, who reduced this strong, passionate individual to a frail old man—“I am not well”—and eviscerated him, body and soul. The keynote figure in Munby’s production was actually Jessica rather than Shylock. The audience apprehended Jewish experience in an anti-Semitic society through Jessica’s attempts to engage with Venetian culture. At first more reprehensible than sympathetic in running off with her lover and her father’s money, Jessica gained the audience’s sympathy when, as an outsider at Belmont, she was ignored by Portia and Nerissa. Later, tutored by Lorenzo in private moments, Jessica learned to dance and to speak in appropriately fulsome language about Portia, whom, understandably, she did not like. Her delight in her new art of dancing and her new golden dress was irresistible. And so the audience was drawn with Jessica into acquiescence in the tempting pleasures of Belmont—that is, until she learned what had been done to her father. Shylock’s exit from the court is his textual exit from Shakespeare’s play, but not from most contemporary productions, which find ways to bring him back to disturb the comic harmony of Belmont. The Olivier production, for example, concluded with the offstage recitation of the Kaddish. The 2004 film of The Merchant of Venice, starring Al Pacino, showed the newly baptized Shylock being barred from the Jewish ghetto. In Munby’s production, while Portia and Bassanio and Nerissa and Gratiano were amusingly resolving their quarrels about their rings, Jessica read with horror the letter that Portia brought to Belmont detailing events in Venice. Implicitly, she realized what she had done in abandoning her father for Lorenzo, Judaism for Christianity. The play ended with a devastating coda as a procession entered to perform the ceremony of Shylock’s baptism. In agony Pryce’s Shylock could barely respond with the required “Credo” to each article of the Christian Creed. In counterpoint to the triumphal Latin chanting of the Catholic ceremony, Jessica kneeled at the side of the stage singing with passionate sorrow a Hebrew prayer of repentance, begging for forgiveness. The Christian procession exited, and Lorenzo returned to take Jessica into Portia’s house. But just as the doors were closing, she turned to face the audience. She was trapped—like Shylock. The exceptional darkness of this ending to what was in many respects an audience-pleasing production of The Merchant of Venice was both deeply moving and theatrically thrilling. And the discordance was by no means out of keeping with what Shakespeare himself does elsewhere in his drama, even in an early romantic comedy such as Love’s Labor’s Lost, which I look forward to seeing at Chicago Shakespeare Theater next February. Verna Foster is a professor of English at Loyola University Chicago, where she specializes in modern drama, dramatic theory and Shakespeare. She holds her PhD, MPhil and BA in English from University of London. Her publications include a book on tragicomedy, as well as numerous articles.